It’s my 10th winter, and I gotta say, my Asian physique hasn’t adapted to these freezing weather conditions yet. My body is begging me to go back to my bed, slide under the covers and hibernate. As long as humanly possible. But humanly possible does not equate to socially acceptable. Thus I find myself bundling up every morning and dragging myself to work. How is this too hard for me?! I have no idea if there will come a time when I can say I have perfectly adapted to the realities of winter. I like the idea of it, the layering, the constant excuse for a cup of tea, and the lovely powder snow when it’s all fresh from the skies. It’s all pretty and sends a warm tingle inside. But that’s only half of it. The mushy snow when it starts to melt, the pangs of cold winter breeze, and the physical struggle every time my feet and hands feel and resemble a zombie’s extremities – this other half is just wearing me down. Put all soup ingredients in a pot and boil. 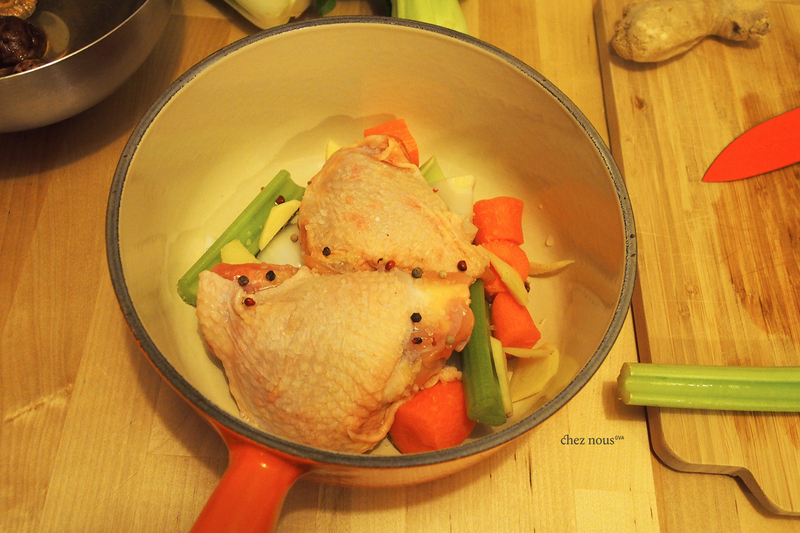 Let it simmer in medium heat for 20-25 minutes or until chicken thighs are completely cooked. Set aside. This will give you a very tasty homemade broth perfect as a soup base. 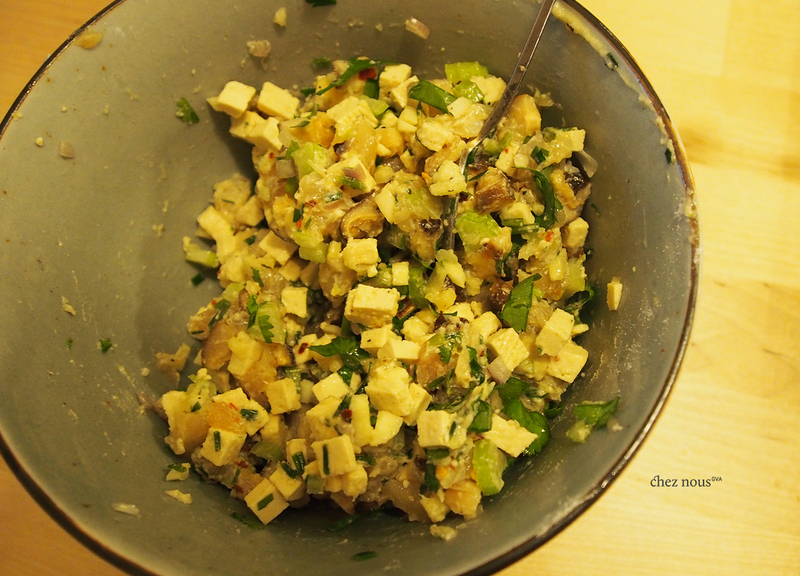 Mince the chicken breast, tofu, mushrooms, celery, spring onions, coriander, shallots, ginger, and garlic. In a bowl, combine all the ingredients except for the flour. Once thoroughly mix, dust the mixture with flour a few times to thicken the filling. 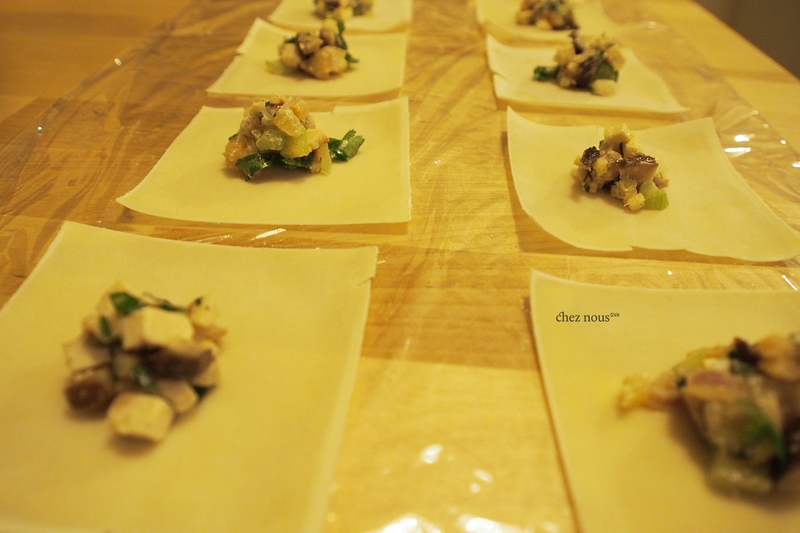 Separate and lay out the wonton wrappers on a plate, cling-on film or any dry surface. Dampen a kitchen cloth or paper towel with water, and use this to cover your wontons. This is important unless you want to end up with dried out wonton wrappers. Keep a small bowl with water near your work station. 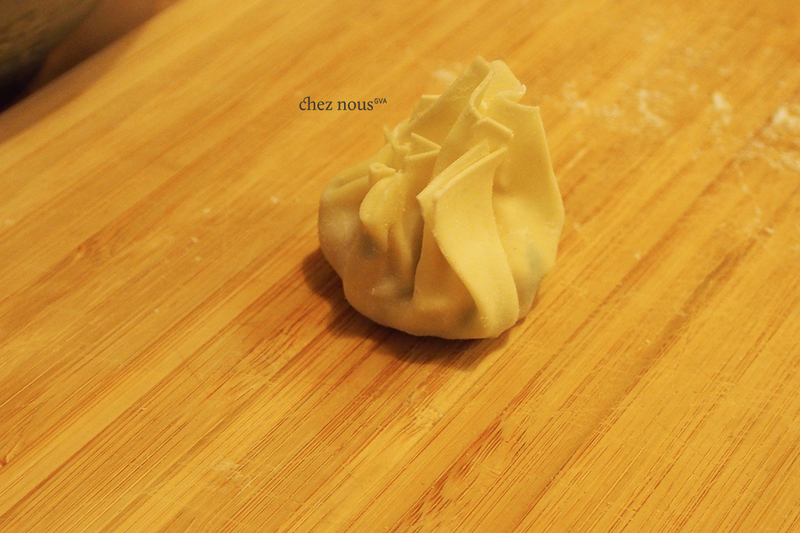 Place a small teaspoon (or even less) of the filling into the center of the wonton wrapper. Dab water through the edges of the wrapper and fold. I followed the Shanghai-style wonton for this part. At least I tried to. 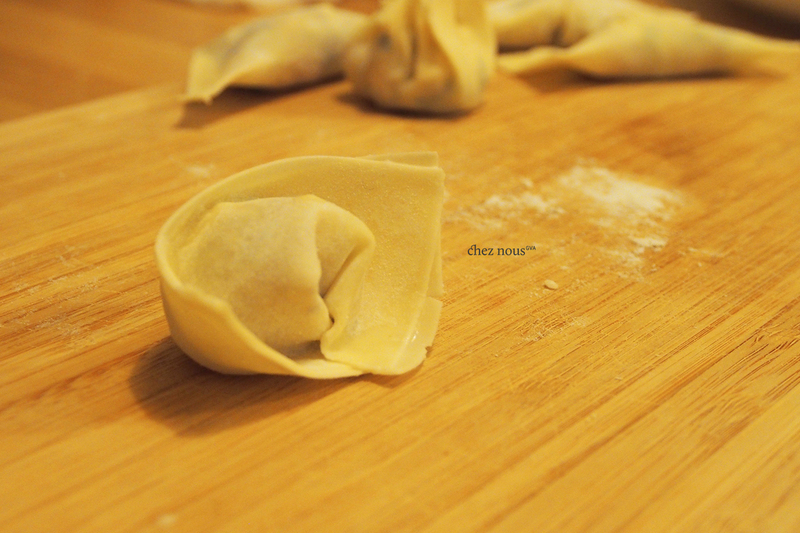 Of course, I was tempted to try other wonton folds (which was or wasn’t a good idea). Now, go back to the broth, and remove all solid ingredients. You can use these for other recipes (hello, chicken sandwich and wraps!). Now, let the broth boil again, and drop the wontons. Let it cook for 4-5 minutes, then add the bok choy. Two minutes in high heat, and it’s done! 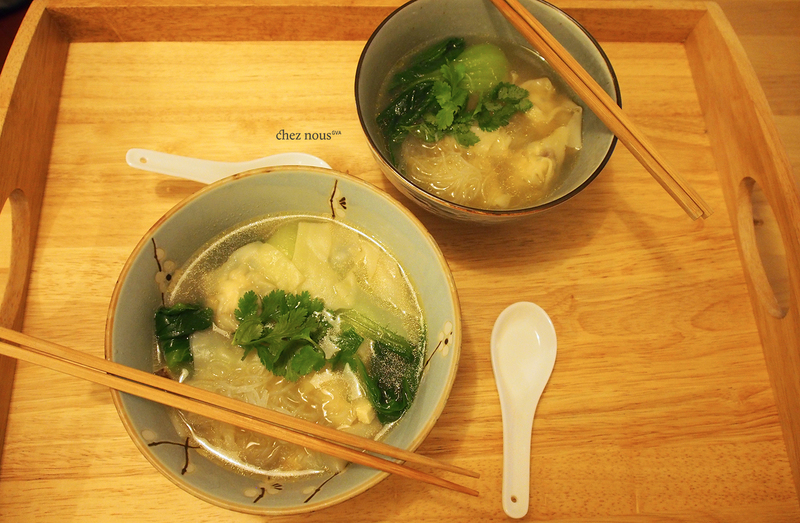 Prep your wonton soup bowls and garnish with coriander and/or spring onions. 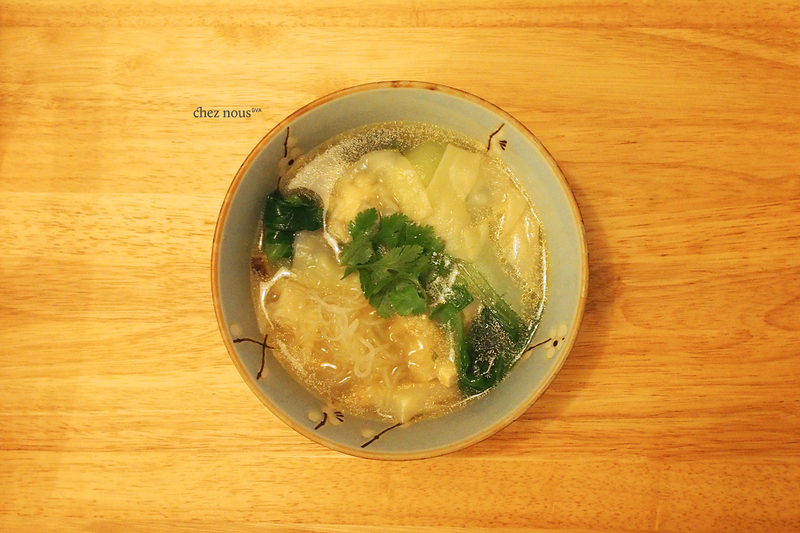 We had leftover vermicelli, so we added them into the soup making it perfect for a winter dinner. *Cue Total Eclipse of the Heart.